Just as in any organization, there is a lot of “behind the scenes” work that must be done in order for our community events and projects to be completed. We are always in need of physical help, whether it is setting up, or cleaning up, stuffing envelopes, or answering phones. We are also responsible for keeping our facilities in working condition and making improvements as necessary. The temporary Parish Council Operations Committee Chair is Mike Anastasio, mikeanastasio1@mac.com. Mission: To assist in office tasks; help with large mailings, bulletin inserts, data entry, answering phone calls, etc. Time: Varies with needs. Many one-time projects several times a year. Talent: A warm and kind disposition and willingness to serve. Mission: To plan and organize the annual Lenten Appeal at St. Mary. Encourage full participation through planning, publicity, and reporting. Time: Annual event, January-May follow-ups. Few additional meetings. Talent: Organization and leadership. Willingness to speak at Mass helpful. Mission: To spread the word about the good things happening here at St. Mary throughout the community. Help keep Parish Life announcements/Calendar of Events current in the Free Lance Star, and bring our news to local assisted living facilities, hotels/motels and visitors’ locations. Time: varies; 30 minutes to an hour weekly depending on the size of the ministry team. Talent: Great at Hospitality and knowledgeable of the Parish Community, able to deliver bulletins and flyers when necessary. Assist with getting announcements into the newspaper and local media as needed. 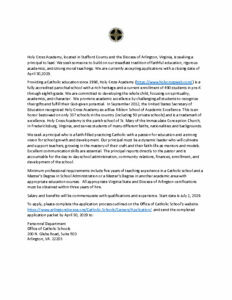 St. Mary looks forward to new methods of soliciting financial support to gather resources for pastoral ministry and faith formation, both in the parish and at Holy Cross Academy. Mission: To cultivate the financial resources of our parish and community by developing and maintaining programs that secure funds to ensure the continued service and maintenance of parish programs and facilities. Talent: Fundraising experience. Organized and friendly. The SCRIP Program is a gift card purchase program that directly benefits our parish school, Holy Cross Academy. Gift cards can be purchased for over 75 local and national retailers who in turn provide a percentage of the gift card face value back to the school. Our goal is to greatly expand the program so that more parishioners will purchase gift cards for routine weekly expenses like groceries, gas, and restaurants. This year we will be emphasizing the use of the convenient on-line sales program, and focusing on new ways to advertise and promote the program to generate more sales. Mission: To manage this ongoing fundraiser which supports our parish school. Time: 30 minutes per week to sell gift cards after weekend Masses at St. Mary and Holy Cross Academy; before Thursday morning Mass at HCA, or during afternoon carpool at HCA. Talent: A willingness to devote time to this important cause by volunteering to staff the sales table after Mass or at HCA. Often there is a great need for assistance to accomplish the goals set by many of the other committees and ministries, and the Operations Committee facilitates their successful outcome. Mission: To organize and coordinate volunteers as they are needed; to facilitate the Lenten Small Groups program; to assist in communications and publicity of parish events; to develop a directory of parishioners’ businesses; to assist in the planning and managing of maintenance and improvements of parish property. Also, facilitating the physical needs of major parish/events/functions. Time: Varies with needs. Some committee meetings. Talent: No training is necessary, however, a diversity of expertise is very helpful.